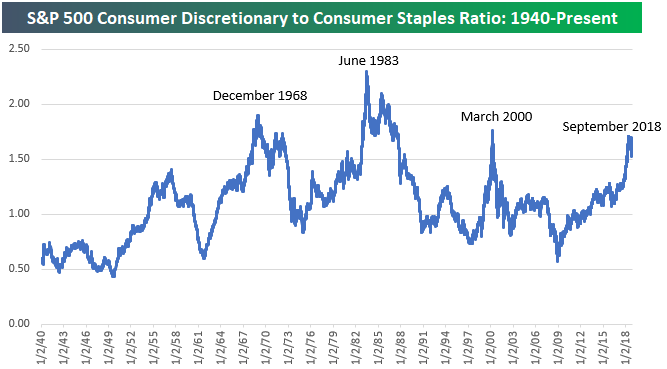 Below is an updated look at the price ratio between the S&P 500 Consumer Discretionary and Consumer Staples sectors. When the line is rising, Discretionary is outperforming Staples, and vice versa when the line is falling. Prior to late September, the ratio had been skyrocketing as investors plowed into Consumer Discretionary and avoided the low-growth, defensive Consumer Staples sector. Over the last month, however, we’ve seen a big rotation out of Discretionary and into Staples. With the Staples sector rallying recently and Discretionary falling, the ratio has suffered a big drop. The last time this ratio peaked was back in March 2000 at the end of the Dot Com bull market. 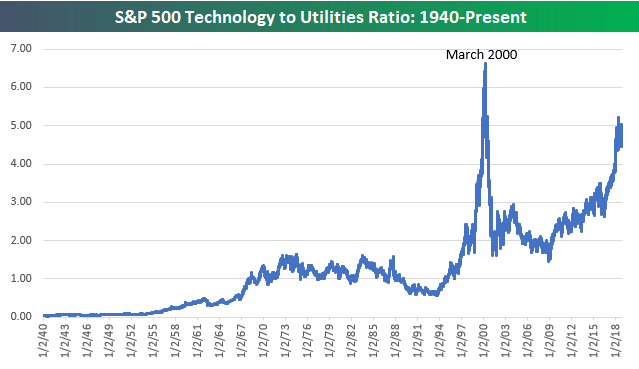 The ratio between Technology and Utilities had also been soaring over the last year or so as the Tech sector took off. While the ratio hasn’t quite gotten to the levels seen at the end of the Dot Com boom in March 2000, it’s still extremely elevated relative to all other periods over the last 65+ years. Back in early 2009, the ratio was at 1.5. It recently crossed above 5 at its peak a few weeks ago. This month we’ve seen Utilities rally and Tech fall sharply, which has caused the ratio between the two to dip a bit. If a peak has been put in, however, it has a long way to fall.